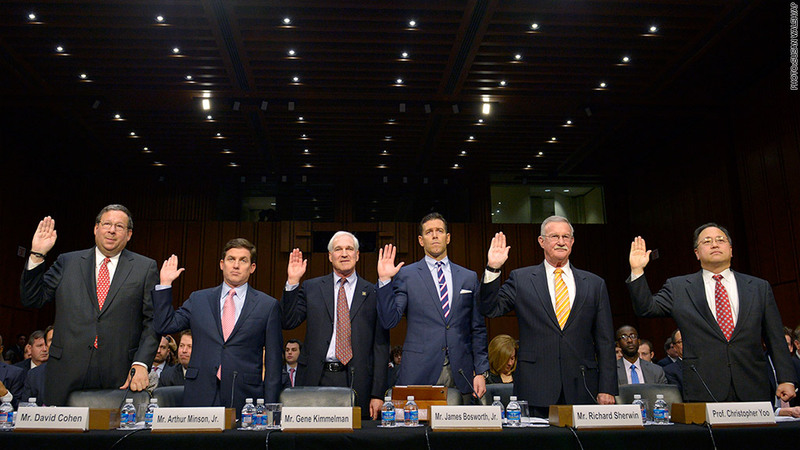 Witnesses including Comcast's David Cohen (left) and Time Warner Cable's Arthur Minson (second from left) are sworn in before Wednesday's hearing. Comcast says its pending merger with Time Warner Cable will benefit consumers, but some senators aren't so sure. Executives from the two companies appeared before the Senate Judiciary Committee on Wednesday to make their case for the deal, but they had a difficult time convincing some members. "What we've heard among some of our colleagues is a general sense of skepticism, which is reflected in the general public, about how this deal will really help consumers," Sen. Richard Blumenthal, D-Conn., said. "The case has yet to be made that consumers will benefit in a tangible, real substantial way." Comcast (CMCSA) and Time Warner Cable (TWC) said Wednesday that the merger will lead to improvements in services for customers, creating scale and cost savings that will drive new investments. Several Republican senators, most notably Orin Hatch of Utah, seemed to agree. Although the combined company would have a presence in 19 of the top 20 U.S. markets, Comcast Executive Vice President David Cohen noted that Comcast and Time Warner Cable don't compete in any of those cities. He argued that customer choices therefore won't be affected. But some consumer groups and politicians are still concerned about the potential power Comcast will have to establish barriers to competing content. "I believe this deal will result in fewer choices, higher prices and even worse services for my constituents," Sen. Al Franken, D-Minn., said. Earlier this year, Comcast caused a stir when it struck an agreement with Netflix (NFLX) in which the online video company reluctantly paid to connect directly to Comcast's network and boost lagging streaming speeds. Franken suggested Comcast had "the power and the incentive to manipulate Internet traffic in its favor," citing the Netflix deal as "an example of that." Cohen responded that Netflix had to pay a connection fee no matter what, whether through third-party providers or directly to Comcast, so the deal didn't create any new expense. "Most of our real competitors are national and global, and larger than us," Cohen said, citing efforts in video from a diverse set of companies including Amazon (AMZN), Apple (AAPL), Verizon (VZ), Google (GOOG) and AT&T (T). "Consumers today are in the driver's seat." The Senate doesn't have the power to challenge the proposed merger -- that falls to the Federal Communications Commission and the Justice Department -- but it's been a hot topic on Capitol Hill nonetheless. Franken said members of Congress and their staffs had heard from "over 100 lobbyists" making the case for the deal. Regardless of how consumers will fare should the merger go through, Time Warner Cable executives stand to reap huge benefits. CEO Rob Marcus will receive an $80 million golden parachute if he's let go after the companies combine, while chief financial officer Arthur Minson, who appeared at Wednesday's hearing, would get $27 million. Questioned by Committee Chairman Patrick Leahy about the fairness of these payouts, Minson said they were "in line" with those granted in mergers of similar scale and complexity. "You may find that not all consumers agree," Leahy responded.